Sunday, September 11. Learn more about Patristic Nectar Publications. This is Fr. 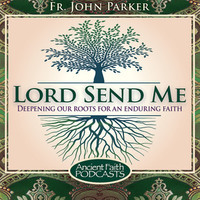 John Parker, the Chair of the Department of Evangelization of the Orthodox Church in America. I’m standing in the middle of the nave of Holy Ascension Orthodox Church in Mt. Pleasant, South Carolina, a parish which I am blessed to serve. I am standing before the beautiful and life-giving cross of our Lord Jesus Christ, adorned, surrounded by a beautiful frame of dozens of red roses, the cross standing in the midst of our temple, as it is planted in the middle of the week of the middle week of the Great Fast, as a reminder that the Church stands before the cross of our Lord Jesus Christ which planted in the center of the earth in the middle of time as the center of everything. We sing countless times, morning and evening, “Before thy Cross we bow down and worship, and thy holy Resurrection we glorify,” always remembering that, through the Cross, joy has come into the world. I’m reflecting on the death of my teacher, the ever-memorable Protopresbyter Thomas Hopko, and I’d like to share a few words of reflection about him from my own experience. Fr. Tom is one who was always, to me, a deeply personal man. There was no time when a conversation was not felt as deeply personal, even if it was thoroughly dogmatic, filled with facts and figures and the quotations from the Bible. I found Fr. Thomas in the years that I’ve known him—about a decade, twelve years or so—always to be one who would try to bring the Scriptures to life in a conversation, and especially in some way that would be applicable to the hearer. In those cases, it would be me when I would be speaking with him. I walked miles and miles and miles with Fr. Thomas. He wasn’t walking, I presume, when I was speaking with him, but because my cell phone did not receive reception in our church building, whenever I would call him, I would have to go outside and walk the streets of the neighborhood around the church. I walked countless miles, listening to his pastoral advice, asking him to clarify teachings of the Church, sitting at his proverbial feet to learn how to speak the truth in love and how to live the truth in love. In fact, in my opinion—I shared this with Fr. Tom on many occasions—I find him to be the one in my own life who lived as closely as possible to what he taught. And for that reason, I found Fr. Tom to be a spiritual giant in a very difficult age. When he would send out, for example, his 55 maxims on living the Christian life, which can be found on the internet and are circulating right now in his memory, that was not a list that he just wrote down. I’m certain of it. That list is a summary in his own words, I think, of every saying of the Desert Fathers and all of the biblical readings that he’s ever read and the Lives of saints which he committed to his own memory and put down on paper, not as an intellectual exercise for anyone but as a way that he himself attempted to live. So I recall one time speaking with him about the vast quantities of emails and inquiries that he must get through his amazing quantities of podcasts on the internet and what to do with the countless questions that would come to him. For Fr. Thomas, it seems, he would simply ask a commitment of people. That is, if you’re interested in an academic answer to something, then go look it up, but if you’re interested to live a life of self-denial in imitation of our Lord Jesus Christ, to attempt to keep his commandments and truly live, then Fr. Hopko I think, certainly with me, but I imagine with everyone who would call him or who would write to him, he would walk, I would say, the hundredth thousandth extra mile in order to be a mentor and a teacher and an imitator of Christ to that person or those people. His maxims, for example, I am certain that he lived by them, each one of them. For him, nothing was an intellectual exercise. For him, as far as I understood him and studied and asked of him, he attempted with every fiber of his being to live that way, to live the way of the cross in the joy of the Resurrection. “We press on,” he would always say. “We press on towards the goal,” is what he meant, quoting the Scriptures. Fr. Thomas Hopko was no gentleman, because, for him, virtue vastly outranked manners. It’s not that he wasn’t a gentleman; it’s just that I think that the term “gentleman” would describe someone in earthly terms, and Fr. Tom had his eyes, I think, always set on the kingdom of heaven. So he was a gentle man, when gentleness was necessary; he was also a firm man when firmness was necessary. But somehow, in my interactions with him, in trying to learn how to pray, in trying to learn how to believe, in trying to learn how to live and to act, in trying to learn how to pastor, he attempted always to elevate those situations out of the worldly level, which would be the level of gentlemen, and into the world of virtue and struggle towards union with Christ. In that sense, I would see Fr. Tom as a true man, in the sense one who in this world, by God’s grace, struggling to live according to the image and after the likeness of God whom we see in the Person of Jesus Christ. When I learned recently how sick Fr. Tom actually was—I always knew that he was not well in recent years; even when he came to visit our parish a few years ago, he was not well in the heart or in the stomach, but when I really learned that we were coming toward the end—I presumed that he would die on Holy Friday, because Fr. Tom is most known for the way of the cross. It’s one of the first lectures I ever heard. Having been a student at Trinity Episcopal School for Ministry, where the cross is at the center of everything, I soaked up every single moment I possibly could of Fr. Thomas Hopko’s Word of the Cross, to hear the beautiful fullness of the Orthodox Christian teaching, the early Christian understandings of what the cross truly is, what it means, how to live accordingly. I figured that he would die on the Holy Friday, since that is the center of the year with respect to the feasts of the cross. As a personal comment, I didn’t expect that he would die so rapidly, but it did not surprise me when I saw the news that he was anointed in holy unction by our metropolitan and other bishops and priests, monastics, and his family at his bedside on the days leading up to the Sunday of the Cross. I thought, well, maybe it would be on the Sunday of the Cross. That would be a fitting day for Fr. Tom to enter into the joy of his Lord. Then it came to be Wednesday, and Fr. Tom, according to the beautiful family reports— I thank you, Hopko family, for sharing those with us so that, though we were not able to be with him by his bedside, we could be by your side in our churches and neighborhoods, praying for you and your father, husband, etc.. Then it came to be Wednesday of the Cross, and I thought: Today, because it is the middle of the middle week of the Great Lent, and the cross is in the midst of the church as the cross is in the midst of the universe. I would check my email and go to the website and see, and we would pray for Fr. Tom in our matins service and in our daily prayers during the day. O thou who at the ninth hour didst taste of death in the flesh for our sakes, mortify the presumption of our flesh, O Christ our God, and save us. I’m certain that Fr. Tom sang that hymn 5,000 times in his life. He certainly taught it, and he struggled, at least insofar as I could bear personal witness, to live accordingly. But what a fitting time for the ever-memorable Protopresbyter Thomas Hopko, to depart this life: at the ninth hour, the hour that his Lord, our Lord Jesus Christ, breathed his last upon the cross, on Wednesday, the middle day of the week, in the middle week of Great Lent, which is the Week of the Cross. What more fitting time for our dear friend, brother, concelebrant, Protopresbyter Thomas Hopko to breathe his last in final imitation of our Lord, and to be freed from his sickness and suffering? In my conversations with Fr. Thomas in recent months—it was probably January when I last heard his voice—he never really wanted to talk about sickness, and yet he did, because he said, actually quoting a friend of his—I’m trying to recall whom now; I believe it was perhaps one of the nuns at Holy Transfiguration, who said, “This is what is going to show how you believe, Fr. Tom.” Certainly from my own conversations with him, in emails subsequent to that and in the updates that we received from his family, he was one who had truly a Christian ending to his life. From that litany that we pray in the services of our Orthodox Church, “For a Christian ending to our life, painless, blameless, and peaceful.” Painless, blameless, and peaceful: certainly peaceful; we hope painless and blameless, having confessed his Lord many, many times, including, I am certain, the last words on his lips as he was being blessed by the cross by the nuns of the Holy Transfiguration Monastery. One who had such influence over so many people, but it was an influence, in my experience, that he never held over anyone. It was a humble, humble influence: a note in the mail with a copy of a sermon or the Life of a saint: “I love this! This is how we should live! Fr. T.” A man who by his words and by subtle suggestions or the kindness of a note or the forwarding of an email to read something which will draw all of us closer to Christ, that was the way of Fr. Thomas. Now such notes and emails and podcasts have ceased from Fr. Thomas, but the legacy of his life is a rich book from which we can continue to live as Christians. In closing, I would simply add that in my experiences of and with Fr. Thomas Hopko in recent years, he always was interested in reality. There were no superfluous conversations. We never talked about anything that was mundane or worldly. He always made every attempt to take that moment, those conversations, and elevate them into the presence of Christ, that God might be glorified in and through them. So, with the passing of our beloved friend and teacher, the ever-memorable Protopresbyter Thomas Hopko, we give thanks. I give personal thanks; I am indebted to him until my own last breath for the kindness and goodness that he showed to me, for the benefit of having had him speak twice in our parish, both privately to parishioners in retreats and also publicly on several occasions in Charleston, South Carolina. Eternally grateful for all that Fr. Thomas gave to me and to my parish, to my family, my children. And we ask God that he would make Fr. Thomas’s memory to be eternal, that he would number him with the saints in paradise, where there is no sickness, sorrow, or sighing, but life everlasting; and that God would grant each of us who has benefited, even in the smallest way, from Fr. Thomas’s lectures, podcasts, homilies, retreats, notes, emails, kind words, and prayers, that we would not treat those simply as personal gifts to cherish but that we would do with them what he did for us with them, which is to show us Jesus Christ.